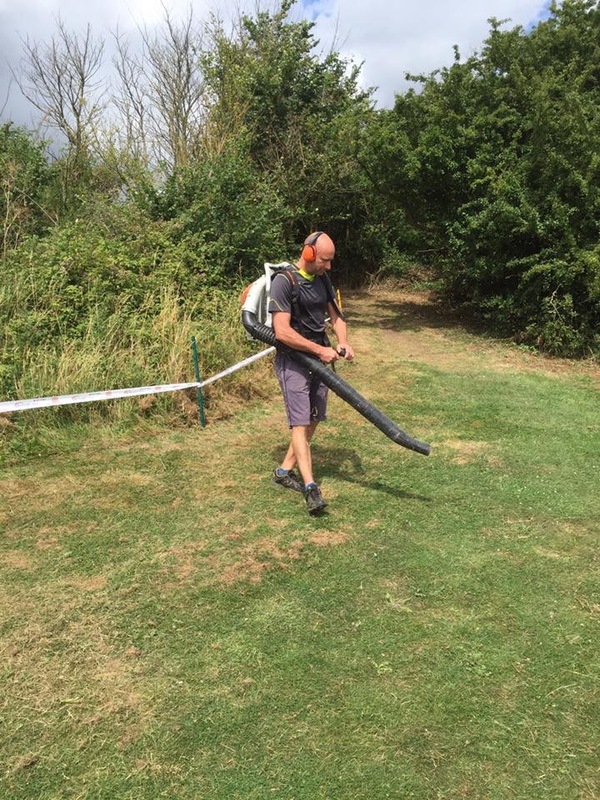 Hadleigh Park Internationl MTB XC race (30th & 31st July 2016). – iainwebbxcmtb: The Pedalling Baron of Positivity. Saddle up and enjoy my world of Mountain biking. iainwebbxcmtb: The Pedalling Baron of Positivity. Saddle up and enjoy my world of Mountain biking. Pedalling Baron of Positivity: Saddle up and enjoy my world into Mountain biking. 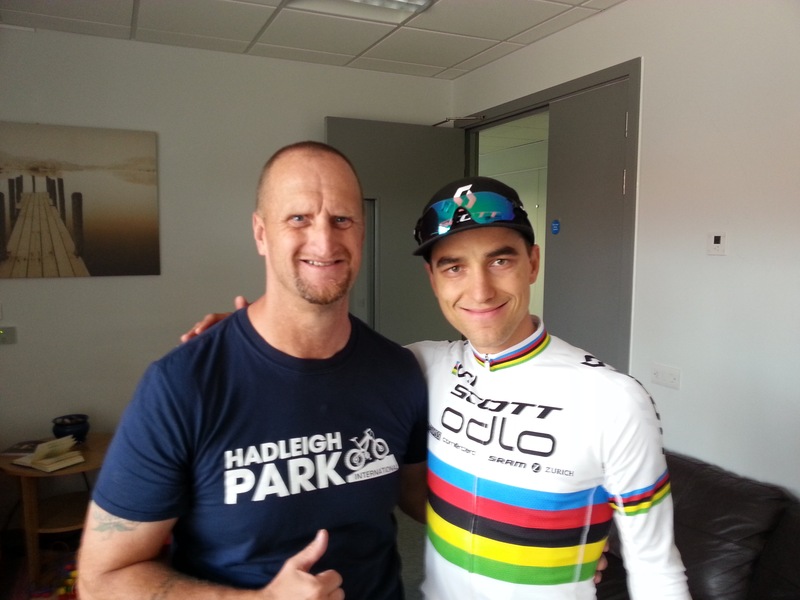 Hadleigh Park Internationl MTB XC race (30th & 31st July 2016). Well says what it is on the tin, ‘International’ means big named stars in the mountain bike XC world would be there, one of their final chances to shine and test themselves before the Rio Olympic Games. 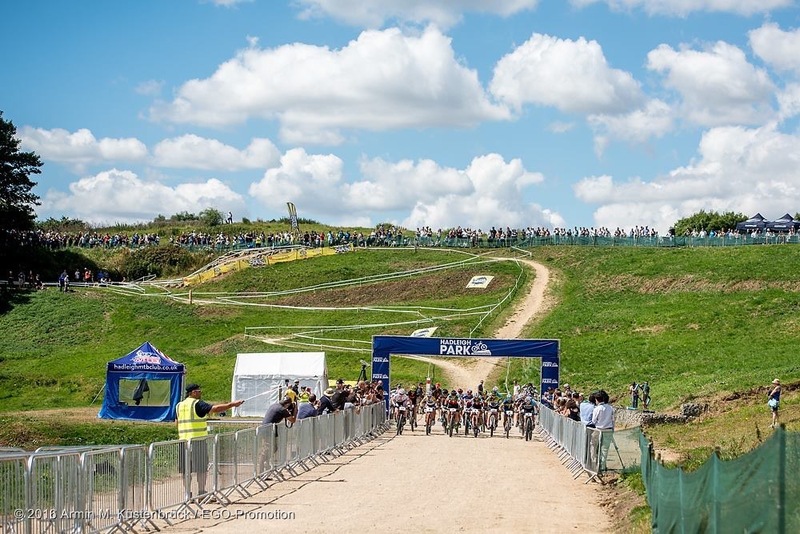 And what better place to do that, then at Hadleigh Park Mountain bike track, part of the legacy from the 2012 Olympics held in the very same spot. Knowing all this I must say put a big smile on my face, after all, some photos and signatures I gathered from the 2012 Olympics to make up the (picture frame!!) would be there. This in mind I promptly put my name down as a volunteer for the three days (3 days? ah yes, the Friday before to help with any last minute preparations). That meant taking a day off work (un paid), ah, what the heck, when and where else would I get such a great opportunity to rub shoulders with the Elite in my chosen sport? 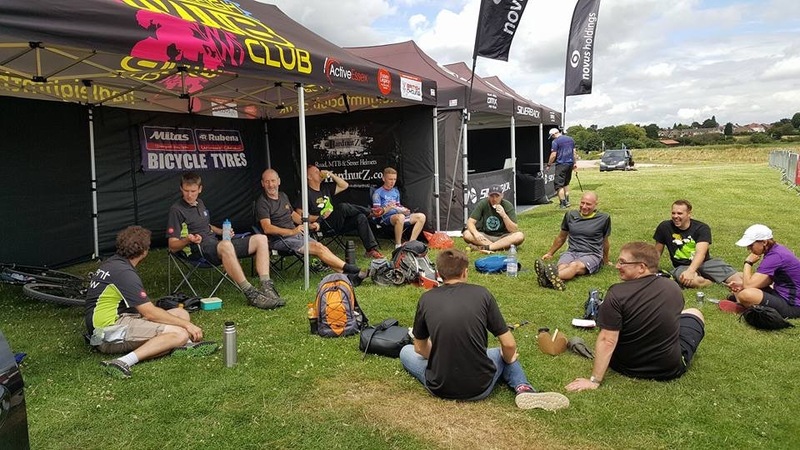 Friday 29th July the volunteers for this day met up at the hub at 11:00 am and made our way to the Gazebo overlooking the MTB track and Park. Matt and James from MSG soon came over to dispatch us into two groups of two, armed with six boxes of cordon tape and off we matched to our start locations. Quite a lot had already been done, well about half, which meant half to do. To our surprise this did not take to long, although it was rather sweaty. All that now remained to do was to blow away any unwanted debris from the track. This was done by an industrial leave blower, 2 stroke petrol engine, carried over the back. Mark Darley seemed to be well up for this job, enjoying it so much, he did the whole track, ummmm boys with toys, know what I mean…….. Afternoons work done, it was back to Marks for Dinner/tea/evening meal, whatever you wish to call this time of day. As we the volunteers for the weekend had to be at the Hadleigh Park Hub for 20:00 hours for a meeting, Mark very kindly offered to accommodate my hunger, so as not to drive, here, there and everywhere. Special mention and thank you goes to Marks lovely wife (Kathleen), superb food and thank you very much for allowing me to share (best wishes & thoughts for the four of you). 20:00, meeting on and full house (oh look, my frame presented to the club and Hadleigh Park over a year ago, on the floor!!)……. Meeting went well, and all volunteers understanding their instructions and duties for the both days. Right then, home to bed as it would and was a long weekend. 07:30 meet and start at the MSG Gazebo ready to be in our places for 08:00. High viz vests, whistles, radio’s and flags handed out, briefing done, off we go to our individual positions. For me it was position M15 (Top of final descent). In position and having a look around the area for anything out of sorts, I was able to report in on radio check, that all was ready at M15. I now sat comfortably on Kev’s camping chair and expectantly waited for the first riders to appear for practice. At 09:00am the first riders started to work they around the track, testing, checking for best lines. This continued to around 11:35 when it was time to clear the track ready for the Youth boys race start at 12:00. Unfortunately the Youth girls race at 11:00 did not take place due to the number of entrants. Shame……..and I’ll leave it at that!! 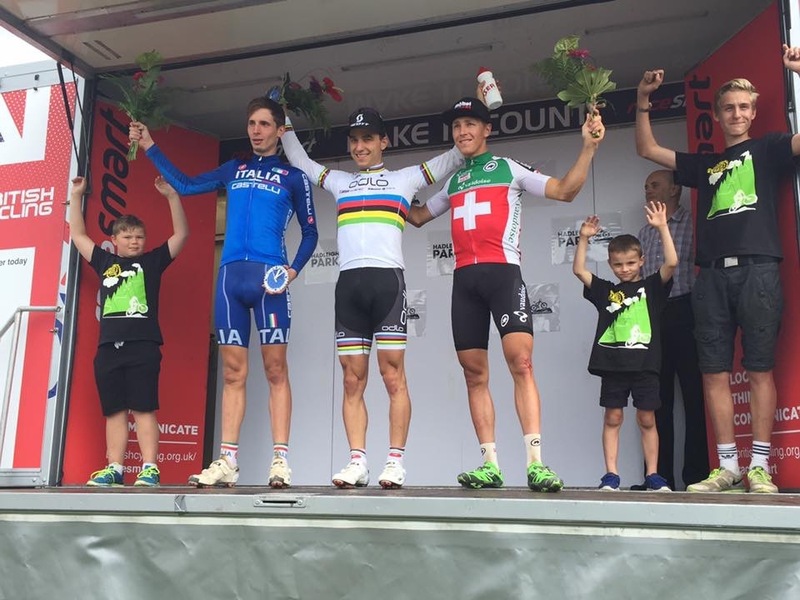 The boys race went well, without any off’s or injuries and the first three riders winning quite comfortably. 1st Charlie Craig – Scott Racing. 2nd Thomas Timberlake – Banjo Cycles. Now time for a lunch break before the UCI course inspection at 13:00 and track opening at 14:00 for Junior & Elite training. This time soon came and went and boy was I in for some awesome viewing from the worlds best as they negotiated the hill of roots and rocks before taking in the drop of final decent. I was in total ore at the speed and skill these riders descended and used the berm at the bottom to further increase their speed. AMAZING, now to practice for myself after watching them very carefully. Shall I? will I? can I? ummmmmm……would be good if I could!! Later in the day managed to take a few photos, with Marco Fontana showing off some skills, doing wheelies up to the drop off and into final descent. The call over the radios came that we could pack away at 16:30 and go home. This we all did and I tried to find some of the riders for selfies but, with no success. I wasn’t to worried as I knew on Sunday there would be time for this! 07:45 the Marshalls went off to their positions, three with some cow bells I brought back from Austria a month ago and I kept one for myself….. I was going to make some noise today and cheer as many riders, showing them what a great place this is and what great support these athletes can get from such a small crowd. Small, yes in comparison to other UCI MTB events held in other parts of the world and I’ll leave it at that, as this is to be a positive write up and not dwell on any negativities…..
08:30 at the Hadleigh Park hub was the meeting time and place for the chaperone crew (to learn their anti doping duties). Three Men and Three ladies, which due to the race format soon became six ladies. 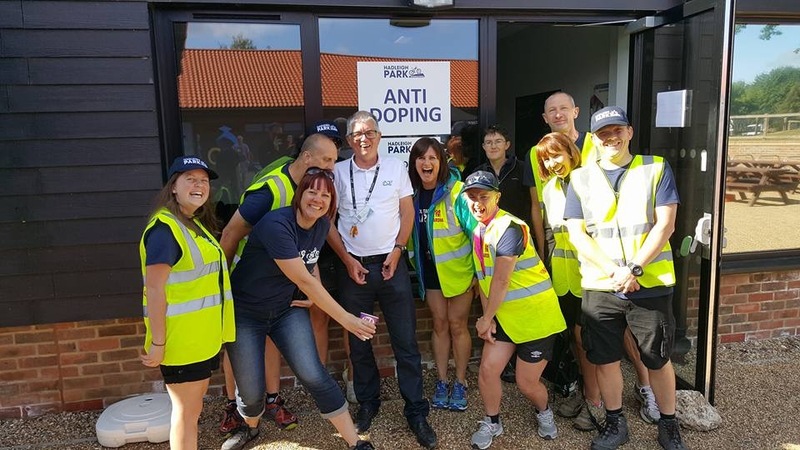 A couple of photos were taken one before (checking out the facilities) and one after passing and signing for our anti doping duties, that’s doping not dopey!! Well we can be serious and silly and makes for a good combination for a happy group and great family (HMTBC). Time now before my first chaperone duty to float around and help out where needed on the course. 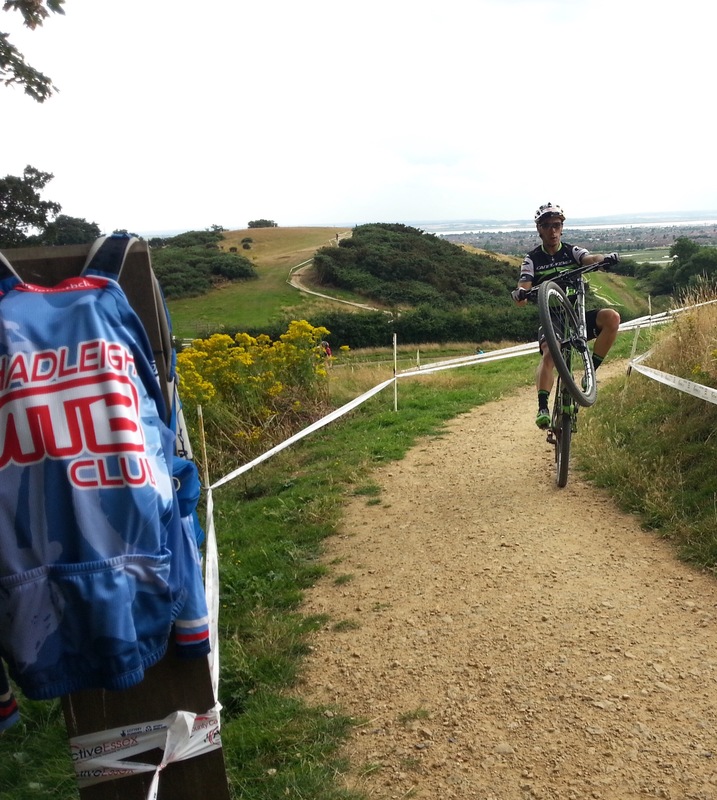 I was placed at the start loop crossing on the hill overlooking the whole track and Hadleigh Park. Aim was to stop human traffic just before the Junior men’s start time at 10:00, once they had passed this location, human traffic was free to cross and I to move on to my next task……. Cheering and making a copious amount of noise….. 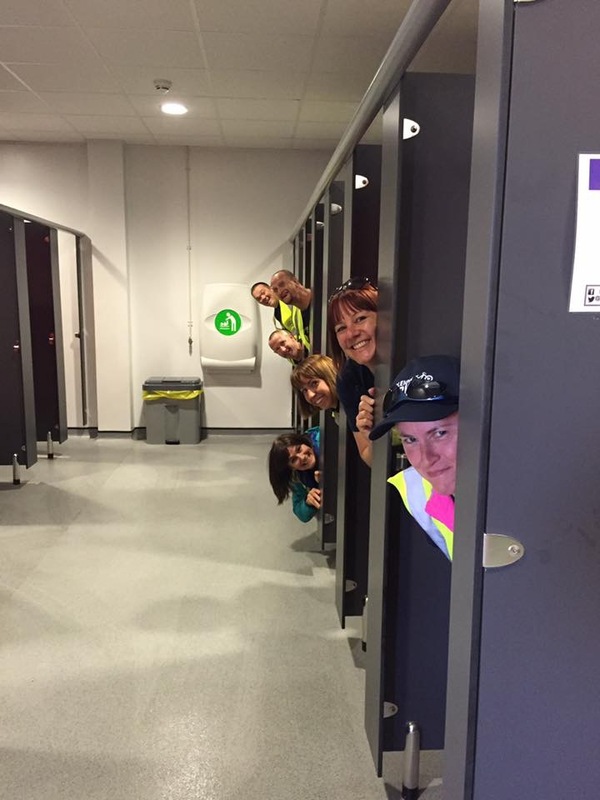 Especially for Robert Staines (whilst keeping an eye on events, Gary our lead coordinator and the time). Robert Staines full on ! I must apologise now for any riders who may have gone home to their respective countries with a little tinnitus. No apologies for the crowds and spectators, you should have been making your own noise, not to hear me? 10:30 I made my way down to the finish line to collect instructions for the rider I was to chaperone to the doping test facilities. 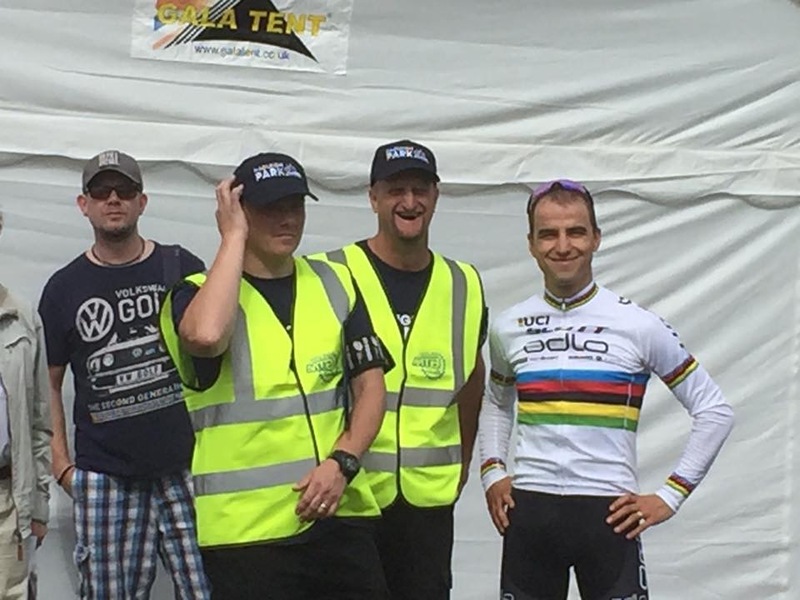 I was given the 4th placed rider over the line and duly set about my task. Once I had finished this duty, i made my way over to Gary for further instructions. Gary placed me with Thomas at the crossing between Triple Trouble and Deans drop which formed a blind spot. Great, a perfect position to blow my whistle to inform Thomas of riders coming and then to ring the cow bell and cheer on all the ladies, both elite and juniors. After the finish of this race it was time to try and get some photo shots before the start of the elite men’s. Time now for the elite men’s race and back over to the first lap crossing to prevent human traffic five mins before the race. Race off, cow bell out and a cheering and ringing we go….. COME ON PHILL, GO SMASH IT!!! And a little more sedately in the back of my brain…..come on Nino…..remember my earlier mantra?? Race well underway it was time again to go to the finish line ready to mastermind my duties of chaperone to the winner…….. I’ve done it once this morning, how hard could it be? Well, with the fans, press, media….. Just a little. My duty was to keep my eye on the winner at all times to let him know I’d be his chaperone and to move with him at all times……. Let him know I was his chaperone, I did not! Move with him, I did not, chased on foot, I did!! You see, he started to cycle back up the hill towards the ceremonies area, fans waiting to get autographs, to where his crew and van were located. Oh great I do not do running, especially up a steep hill and to leap a fence into a crowd would be fun……. I kept my eyes peeled firmly on him, running up the hill, beads of perspiration forming, redness appearing in face and mouth starting to froth, ha! The fans saw me coming and politely moved away as I manoeuvred over the fence with the grace of a rhino in a china shop……..
Oh yeh! 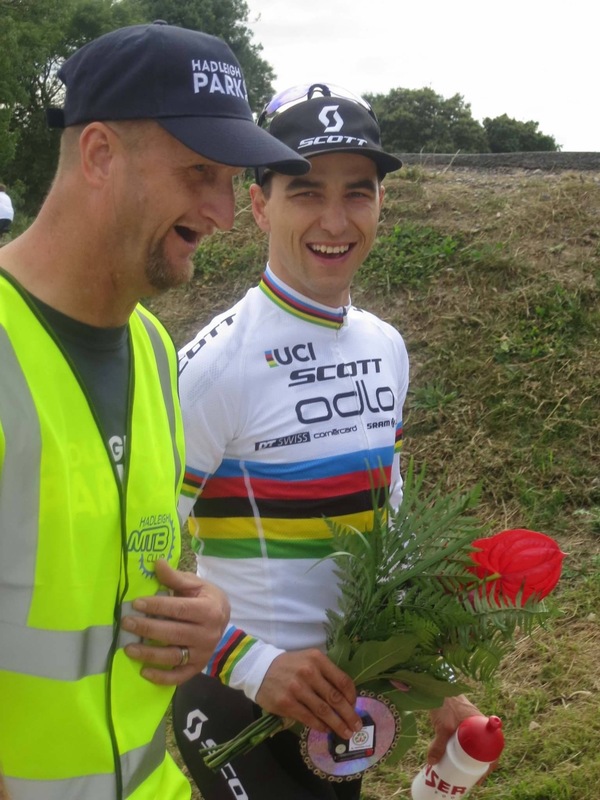 My own sprint finish against Nino Schurter, finish line in sight, one more last push and Boom! Photo finish with the worlds best as we eye ball each other in the Scott gazebo. (N) “Ah, your my chaperone, ops sorry about that”, (I) “That’s fine, you weren’t quite quick enough, this time and you have just finished a race”, we smile, introductions done and paper work signed. It’s now off to his van for Nino to get changed before the podium presentations. Still got to keep my eye on him, that was weird but a job is a job after all and not many people can say they saw Nino (Happy Birthday)!!! Now changed we move from his van , through the waiting fans and onto the podium area, where we wait until the three winners are called up. It was great to see Hadleigh MTB Club youth members being given the opportunity to present flowers and gifts. Well done Mason Porter, Harrison Darley and Ted Osbourne. (Hanging up in the meetings room by a piece of string,)!! (Disgusting, Disrespectful and those involved, hang your heads in shame). I suppose, one good thing, it did make it from the floor to the wall!! At the Hub, Nino stopped, pointed at the prints around the windows, said and asked, “good images, who are they, are they famous”? I knew what he meant…… I just shrugged my shoulders, gave a little chuckle and said “politics”. We smiled and made our way in the the test holding room. 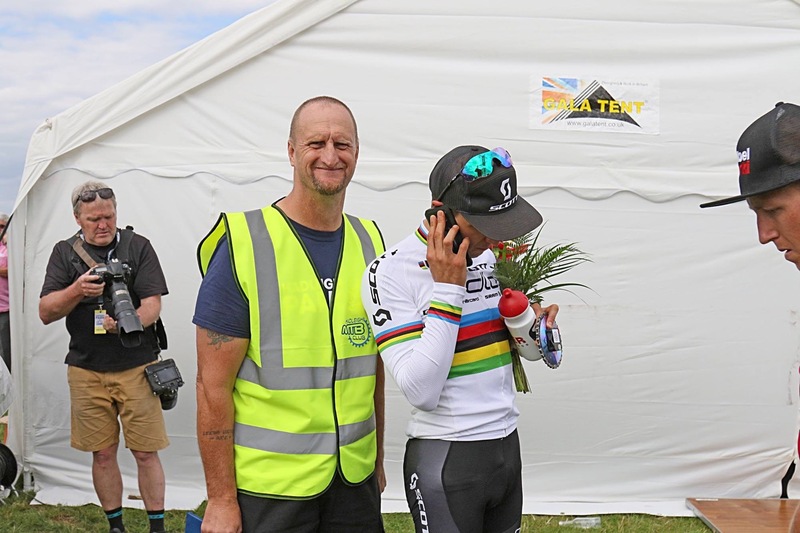 Here I stayed until tests had been completed, then asked Nino to sign an old club race shirt for a friend and had my picture taken with the worlds best mountain biker (Nino Schurter). To MSG (mud sweat and gears) for all your hard work putting on and setting up such a fantastic International event. Wow, you guys are amazing and massive kudos, we couldn’t have done this without you. To Hadleigh Park crew for your involvement. To Gary and Mel, for your massive contribution, for without you, these events would never get off the ground. To all my fellow, Marshall volunteers, you rock and what a family. To all those that did not get involved…. Read the stories, watch the videos, see what you missed for FREE!!! Stick your hand up, get involved, instead of of a few hundred people watching,,we could have thousands (think of the revenue for the county of Essex ((Essex Council))!! 2nd No.10 IT. Luca BRAIDOT. 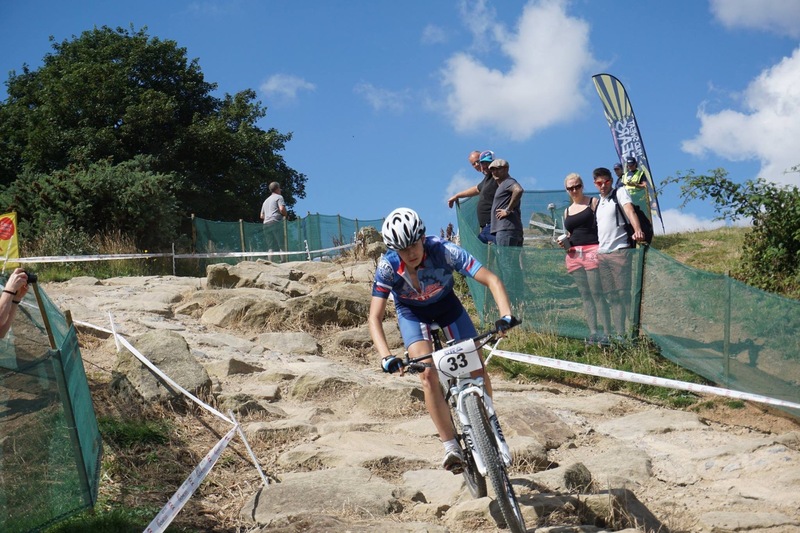 Next Next post: British Cycling XC MTB national championship series 2017, Round One.